With an opportunity for everyone to “catch their breath” before beginning the more significant work of the full Assembly in plenary sessions, we gathered together to worship our God in an ecumenical service. With the proclamation of the Word offered by Rev. Najla Kassab (National Evangelical Synod of Syria and Lebanon), president of the World Communion of Reformed Church, there was a message focused on the reconciling work of the gospel in Jesus Christ. Having been challenged and fed by the Word, we were nourished at the table of the Lord’s Supper. Throughout the day, there were opportunities for various ecumenical delegates to both speak and pray. With the plenary session in the afternoon, a comprehensive consent agenda was submitted which included eighty seven items. It included more perfunctory and procedural matters, but also resolutions and proposals that were passed with little or no controversy and had a nearly unanimous or more vote (requirement of at least 75%) within the committee. One of those items that was included and passed by “consent” was the Commissioner’s resolution initiated by Sue Washburn on addressing the impact of the opioid crisis and other substance abuse disorders upon our churches and our communities. Other items included and approved in the consent agenda included an overture to have a team created to review the current per capita based system of funding the ministry of councils higher than the session. Reports from agencies of the church as well as listings of affiliated colleges and nominations for seminary trustees were included in this agenda. Other consent items affirmed previous commitments of the church regarding caring for our earth, responding to rights violations around the world and participation in ecumenical groups. As the Assembly began, seven items were “pulled” from the consent agenda for later consideration and debate included items on education and advocacy regarding climate change, a statement about racist nationalism, a call for a moratorium on executions, condemnation of the violence in Gaza, support for the “Reclaiming Jesus” statement, and study the forthcoming international automation crisis. Beyond the consent agenda, the following items were some of those taken up and passed during the Assembly plenaries on Wednesday afternoon and evening. Affirmed by voice vote the overture from the Presbytery of Carlisle affirming the historic commitment and encouragement to interfaith relations, dialog and understanding. 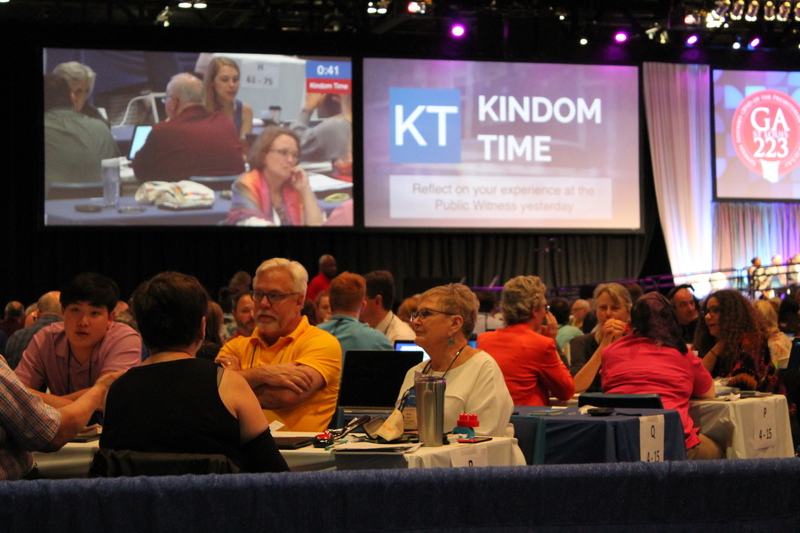 Then, the Assembly acted in response to a special committee report to encourage the Presbyterian Mission Agency in supporting and resourcing presbyteries in the shift toward intergenerational faith formation as an expression of our Christian education and formation ministries. Voted not to include language for questions to the “presbytery” during an installation service of a teaching elder. Recommended a task force to develop a letter and statement to accompany the Belhar Confession that would address our own American context both historically and our present environment. Referral of the “Reclaiming Jesus” statement for prayer, study and examination as well as developing ancillary materials. Recommendation that 223 General Assembly commends the “Letter from Birmingham City Jail,” written by Reverend Dr. Martin Luther King Jr. to the church for study, as a resource that provides prophetic witness that inspires, challenges, and educates both church and world, and furthermore, to begin the process outlined in G-6.03 to include it in the Book of Confessions. Board of Pensions, Presbyterian Investment Loan Program, Presbyterian Foundation, and Presbyterian Publishing Corporation. Confirmed the election of the Reverend Dr. Thomas F. Taylor for another term as president and chief executive officer of the Presbyterian Church (U.S.A.) Foundation. Presbyterian Publishing President Mark Lewis highlighted some of the new resources from the corporation including the new Book of Common Worship, new confirmation curriculum, and new resources focused on children. Presbyterian Investment and Loan Program President Jim Rissler spoke of the hundreds of the congregations with which they have worked on building programs over the last two years. Board of Pensions President spoke of the ongoing changes in the programs in order to include other employees and seminary students. He also addressed some of their new initiatives to proactively address the need to recruit, support and retain pastors through dues incentives and debt relief. Approved formation of an administrative commission to address disorder and seeking healing and reconciliation within the Synod of the Covenant. Reaffirm the Committee on Representation requirements for inclusiveness as stated in the constitution (G-3.0103) paying careful attention to the issues of inclusiveness and fair practices by the pastor nominating committees and committees on preparation for ministry. Approved the Presbyterian Mission Agency Mission Work Plan for 2019-2020 written in the form of an order of service within worship. Creation of a task force to investigate the need for an Advocacy Committee for LGBTQIA+ concerns. The task force will report back with recommendations at the 2020 General Assembly. Urge councils to repudiate the “Doctrine of Discovery” and to review the existing study resources on the “Doctrine of Discovery” posted on the Facing Racism website. Directed the Presbyterian Mission Agency to work with mid-councils to facilitate an assembly-wide inventory documenting the physical needs of Native American churches and chapels and creating an ongoing fund for urgent and immediate repairs and improvements. The property assessments shall be done before the next General Assembly. Recognized the 10-year anniversary of the “Comfort My People: A Policy Statement on Serious Mental Health Illness” and establish a grant program for resources that will be used by presbyteries, congregations and seminaries to further educate these entities regarding serious mental illness. Confirmed the election of the Reverend Doctor Diane Givens Moffett as Executive Director of the Presbyterian Mission Agency. As with any large group meeting operating under the rules for parliamentary procedure, there was some adjustment along the way during these first plenary sessions as everyone became more accustomed to the means by which items may be considered, deliberated, revised, processed and decided. All in all, items were handled in ways that provided for discussion and dissent. As with any Assembly, with all of its committees, the temptation is always present to attempt to address every issue with urgency and before the next General Assembly. Consequently, each action is anticipated by financial implications which are often based upon the work of staff and national agencies.